Although the statutory bush fire danger period (NSW Rural Fires Act 1997) nominally runs from 1st October to 31st March, NSW has extended the BUSHFIRE DANGER PERIOD for our LGA to commence early from the 1st September 2018. During this extended BUSHFIRE PERIOD you must obtain a Fire Permit to undertake hazard reduction burns, pile burns, or other open fires. Fire Permits must be registered and obtained in the first instance from Queanbeyan Fire Control (02) 6128 0600. A Permit Issuing Officer is under no obligation to issue a permit. Permits are not issued automatically. Location, type of material, weather conditions, lack of a suitable water source to control the fire, and other factors may prevent a permit being issued. the fire is in a permanently constructed fireplace. at a site surrounded by ground that is cleared of all combustible materials for a distance of at least two metres all around. 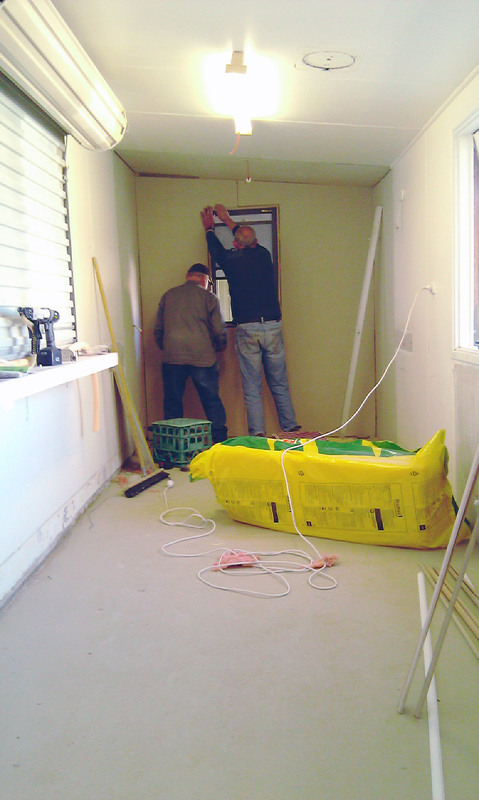 it can be contained and controlled within the specified area. whether a No Burn day has been declared by the Environment Protection Authority. whether a Total Fire Ban is in force. For further information regarding Fire Permits and their use, visit the NSW Rural Fire Service website at www.rfs.nsw.gov.au or ring the Fire Control Centre in Queanbeyan (weekday business hours) on 6297 1840 or Wamboin Rural Fire Brigade Captain on 0409 991 340. The statutory bush fire danger period (NSW Rural Fires Act 1997) runs from 1st October to 31st March. This is the time when our area and elsewhere in the State are particularly prone to the threat of wildfire. It is also the time when you need to have your Bushfire Survival Plan prepared and be ready to implement, sometimes at very short notice. Burning off, if you must do it at all, should be reserved for the cooler months of the year. If, however, you are planning to light a fire in the open between 1st October and 31st March, you will need a Fire Permit. 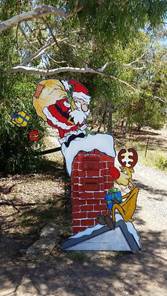 Once again the community mailbox decorating contest brought out our communal creativity. 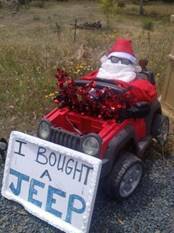 It’s fun to see a bit of special holiday fun as we drive around. The submissions are judged by the WWOWs from photographs. This year the Wonderful Women of Wamboin shortlisted a group of wonderful submissions (below). In addition, the WWOWs recognised the work done by children, and each child named in a submission received a personalised tree ornament with surprises inside. The second prize basket went to 64 Majors Close. There where many honourable mentions. Below a collage of some of the shortlisted Decorating Competition entries. 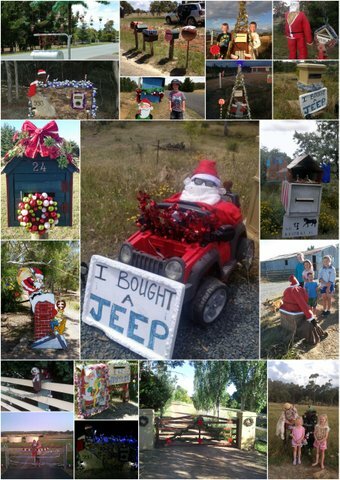 A big thank you to everyone who participated and helped to make Christmas a merry affair in Wamboin and Bywong. A pile burn is the burning of cut and stacked vegetation. A pile burn would normally comprise vegetation resulting from removal of bush fire fuels or property maintenance such as fallen or cut branches from bushes or trees, prunings and leaf litter from around buildings or other assets on your property. You may only burn vegetation emanating from your property, no household waste or building materials. While fire can be a useful tool for reducing bush fire hazards, alternatives such as composting or removing the material from your property should also be considered. Outside the declared bushfire danger period (normally 1st April to 30th September) a Fire Permit is not required to burn off in the open (unless the burn could be of danger to a building). There are however, certain mandatory notification requirements to your neighbours, other property holders in your vicinity and the local Fire Control Centre see details below. During the declared bushfire danger period (normally 1st October - 31st March, but the dates can be widened if the danger levels warrant tighter controls), a Fire Permit is required for any fire lit in the open. For further advice and to seek a Fire Permit contact the local Fire Control Centre (Lake George Zone FCC in Queanbeyan) on (02) 6128 0600 during weekday business hours. Management including containment of a fire originating on your property is your responsibility. Don’t light the fire if you are concerned about current or expected weather conditions on the day or it is a day of Total Fire Ban. If you are contemplating a pile burn you will find that a pile that no greater than 2 metres long and 1.5 metres high works best; it will be more manageable and produce less heat. Ensure there is a sufficiently cleared area around the pile. Also make sure that you are appropriately dressed, have an adequate continuous water supply to contain or extinguish the fire, and remain vigilant until the fire is extinguished. 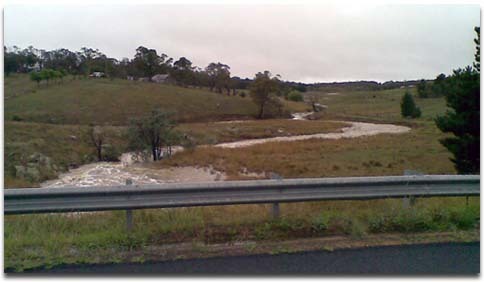 Further general information can be found on the NSW Rural Fire Service website. the local Fire Control Centre (Lake George Zone FCC in Queanbeyan) on (02) 6128 0600 during weekday business hours at least 24 hours before you light the fire. Your thoughtfulness will help minimise neighbour anxiety and unnecessary brigade call-outs. Should the fire escalate to become more than you can handle, don’t hesitate, ring Triple Zero (000). Although the statutory bush fire danger period (NSW Rural Fires Act 1997) nominally runs from 1st October to 31st March, NSW has extended the BUSHFIRE DANGER PERIOD for our LGA to 30 April 2015. For further information regarding Fire Permits and their use, visit the NSW Rural Fire Service website at www.rfs.nsw.gov.au or ring the Fire Control Centre in Queanbeyan (weekday business hours) on 02 6128 0600 or Wamboin Rural Fire Brigade Captain on 0409 991 340. 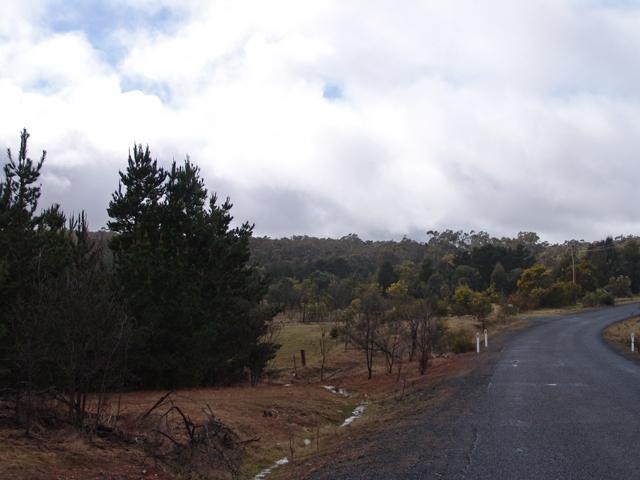 The Dual Sport Motorcycle Riders Association ACT Branch (DSMRA) annual Kowen Forest Ride, originally scheduled for April, was postponed due to wet weather and has now been rescheduled to 20-22 June 2014. 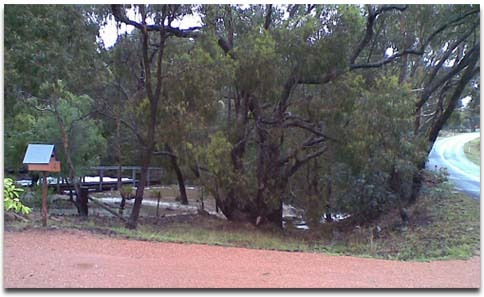 The DSMRA would like to notify all residents in the Wamboin area that Kowen Forest will be CLOSED to the public from 5pm on Friday 20 June 2014 to 12:00 midnight Sunday 22 June 2014. This closure does not apply to the areas known as Sparrow Hill, Orchard Block or the car park recreation area at the bottom of Molonglo Gorge. Relevant signage will be posted around the closed sections. The forest will be closed for a non-competitive motorcycling event - the DSMRA's Kowen Forest Ride 2014. This ride is held over two days and is organised as an annual membership drive for our association. It also raises money for charities such as the Snowy Hydro Rescue Helicopter and ACT SES branches. All bikes are registered and each rider must have a valid motorcycle licence. All riders are required to comply with the 40km/h forest speed limit and will not enter the motorsport exclusion zone, particularly the area adjacent to the northern boundary of the forest on "Wamboin Break". The section of Seven Mile Road adjacent to Wamboin will not be used as a transport section for DSMRA riders, however we have been advised current forestry operations will continue in that area. Preparations for the DSMRA event will commence from 10:30am Friday 20 June 2014. Riders who have travelled from interstate and intend to camp (at the old Depot site), and suppliers delivering event infra-structure, will start to arrive from this time. Notices will be put up before the event advising of the forest closure. "Forest Closed" signs will be deployed at more than 50 locations around the forest perimeter. As Kowen Forest is declared closed by TAMS, the DSMRA advises residents, walkers, runners, hikers, horse riders, bicycle riders and any other recreational forest users, not to enter the forest during the closure. Entering the forest during the closure may endanger you, domestic animals, and the DSMRA riders. As this is not a spectator event there will be NO PUBLIC ACCESS via Seven Mile Road, Kowen Rd (the main gate), Millpost Lane (at either the seismic station gates or the sheep boundary gate), Charcoal Kiln Rd, or any other entry point, for the specified closure period. The forest will be re-opened to the public from Monday morning after the event. Please be aware there will be increased traffic on Kowen Rd and areas around the Depot site for preparation on the days before and the tidy up after the event. However please be aware that there will be increased traffic on Kowen Rd and areas around the Depot site for preparation and the tidy up on the days before and after the event. If you have any questions, please contact Territory and Municipal Services (TAMS) on 6205 9883 or DSMRA Duty Officer by telephone 0490 456 041 or by email: kowencomm@dsmra.asn.au. The Dual Sport Motorcycle Riders Association (DSMRA) would like to notify all residents in the Wamboin area that Kowen Forest will be CLOSED to the public from 5:00 pm Friday 11th April to 12:01 am on Monday 14 April 2014. This closure does not apply to the areas known as Sparrow Hill and Orchard Block. The forest will be closed for a non-competitive motorcycling event - the DSMRA’s Kowen Forest Ride 2014. This ride is held over two days and is organised as an annual membership drive for our association. 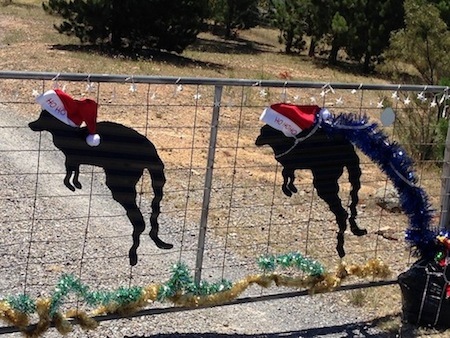 It also raises money for charities such as the Snowy Hydro Rescue Helicopter and funds for the ACT SES. All bikes are registered and each rider must have a motorcycle licence. 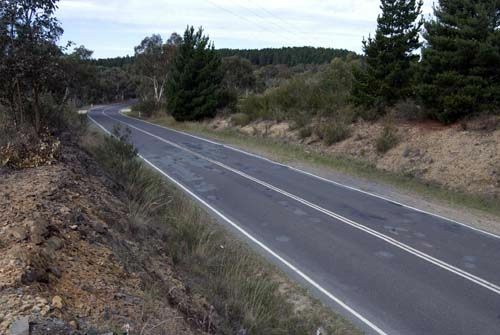 All riders are required to comply with the 40km/h forest speed limit and will not enter the motorsport exclusion zone particularly that which is adjacent to the northern boundary of the forest on Wamboin Break. 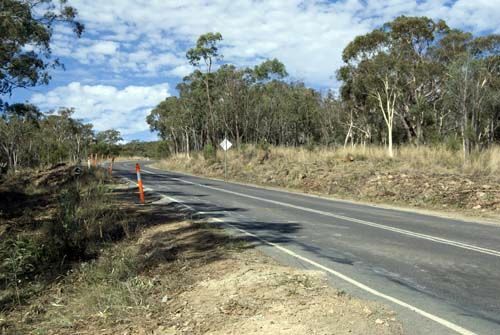 The section of Seven Mile Road adjacent to Wamboin will not be used as a transport section for riders – though current forest operations will continue to use that area. Preparations for the event will commence from 10:30 am Friday 11 April 2014. Riders who have travelled from interstate and intend to camp (at the old Depot site), as well as others delivering event infra-structure, will start to arrive from this time. Notices will be put up before the event advising of the forest closure. “Forest Closed” signs will be deployed at more than 50 locations around the forest perimeter. The DSMRA requests that residents, walkers, runners, hikers, horse riders and bicycle riders do not enter the forest during the closure, as this may endanger you, your animals and the riders. As this is not a spectator event there will be NO PUBLIC ACCESS via Seven Mile Road, Kowen Rd (the main gate), Millpost Lane (at either the seismic station gates or the sheep boundary gate), Charcoal Kiln Rd etc for the specified period. The forest will be re-opened after the event, and open to the public for Monday morning. 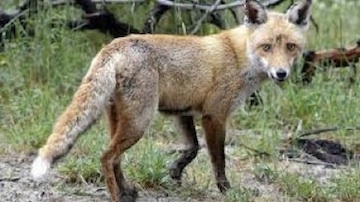 From 28th March until 4th May 2014 a number of landholders on Millynn Road, Schofield Lane and Bungendore Road in Bywong will be undertaking a 1080 fox baiting programme in accordance with the PESTICIDES ACT 1999 – PESTICIDE CONTROL ORDER UNDER SECTION 38. Although every precaution is always taken, you should be mindful of the potential for non-target species to pick up baits, especially dogs. 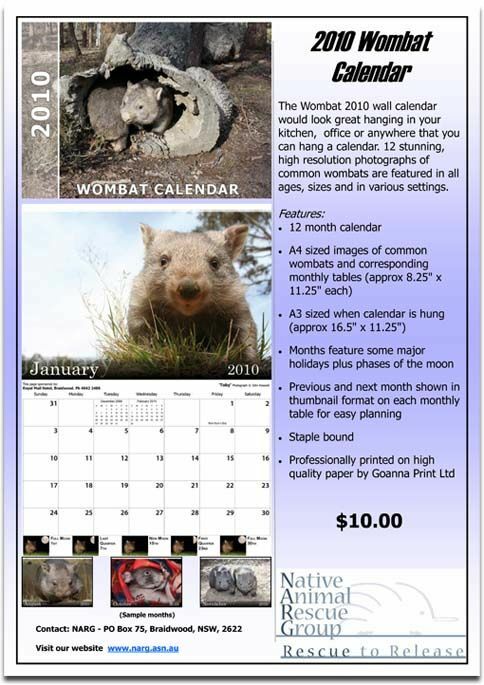 This baiting programme is part of the Greater Goorooyarroo project. For more information please contact Greening Australia Capital Region. All participating properties will be clearly signed. 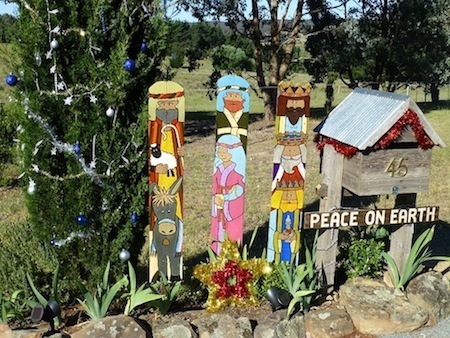 2nd prize to the Ruting family, Brooks Road for their three wise men. 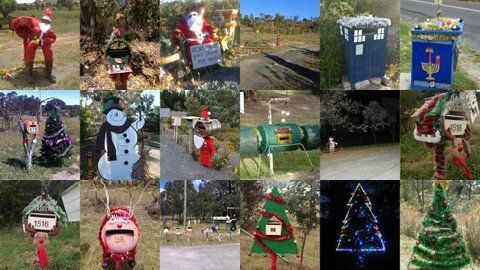 The following is a montage of the finalists for the 2013 Wamboin/Bywong letterbox and gate decorating competition. The competition was sponsored by the Wonderful Women of Wamboin who thank all those who decorated, and congratulate the shortlisted artists on their creativity and workmanship. 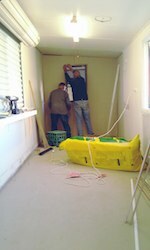 After the weather delays of the last couple of weeks, the primerseal was laid on most of the new work today. 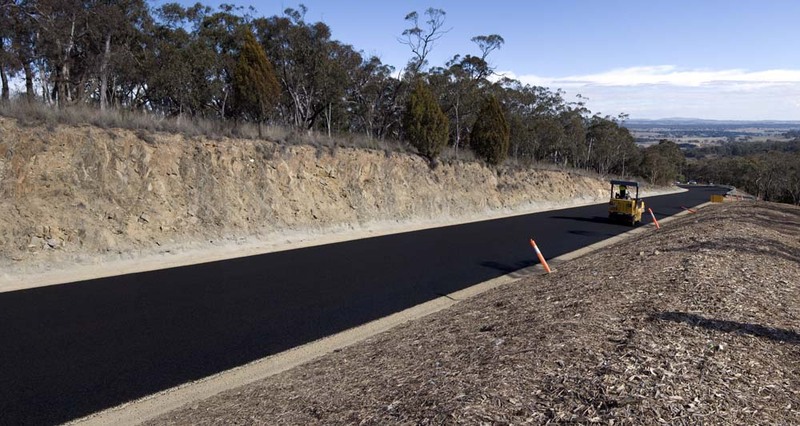 Being laid in the colder weather, this in initial bitumen seal must be 'thinned' with kerosene so that it spreads satisfactorily. If we have a warm summer, the kerosene will bleed off quickly and the final seal can be applied then, otherwise the final seal will probably not go on until late in 2014. The road will be line-marked in the coming weeks. The drains are complete and the guard rails have been installed. Many of the disturbed earthworks areas have been mulched. 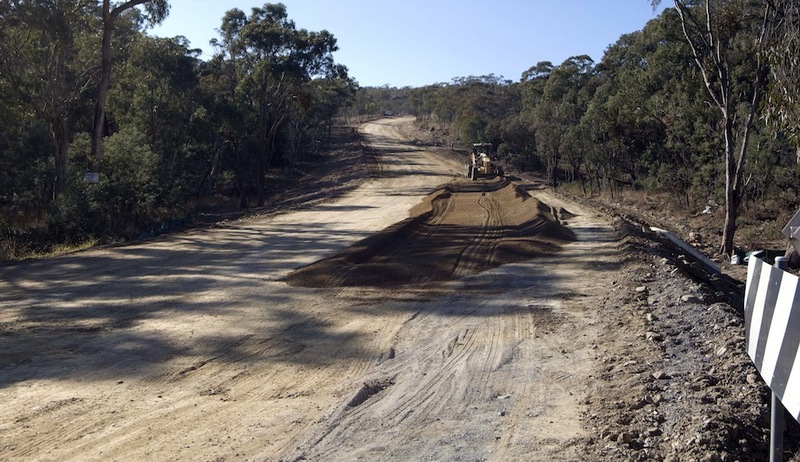 The road widening around the entrance to the tip and new waste transfer station has commenced. The road is once again open to traffic, and it's looking good. There's still a bit more concreting to do (drains), and gravel to lay down, but the project is comfortably on schedule for completion by early July. Four weeks in and we're doing the kerbs and laying down the sub-base, comfortably on schedule for reopening to traffic on 17 May. The sealing, line marking and barriers will then be completed 'under traffic'. Three weeks in and the heavy work is done at the the top of the hill. Further down, it's almost complete. Five days in and the heavy equipment continues work at the the top of the hill. Initial preparations are underway for the major rehabilitation work on Macs Reef Road. Residents will have noticed surveying and clearing works on the road verges in recent days. The following photos are a snapshot taken yesterday (March 16). We'll provide periodic updates as we can. In the coming months, the section of Macs Reef Road between Bankers Road and Newington Road will be undergoing major rehabilitation works. Of particular note is the fact that, from 8 April to 17 May 2013 THIS SECTION OF MACS REED ROAD WILL BE CLOSED TO ALL TRAFFIC. For the duration of the roadworks, and for this period in particular, motorists are advised to familiarise themselves with and use alternate routes. 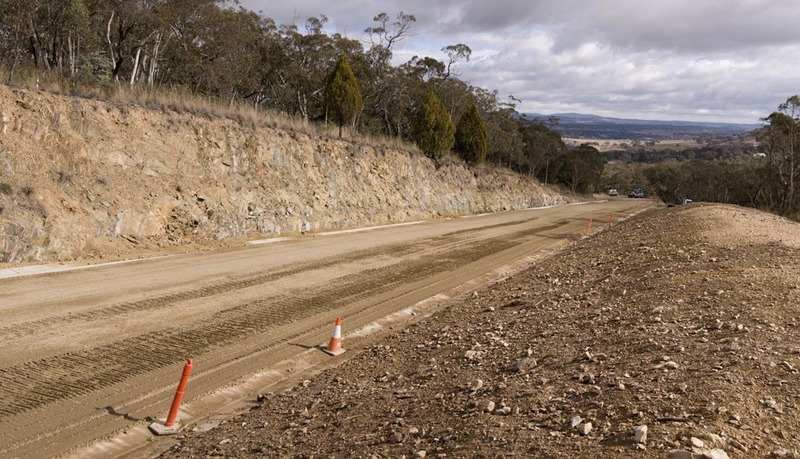 It takes only a couple of minutes longer for through traffic to access the Federal Highway via Bungendore Road and, even when Macs Reef Road is again open to through traffic, delays can be expected while the roadworks are completed. 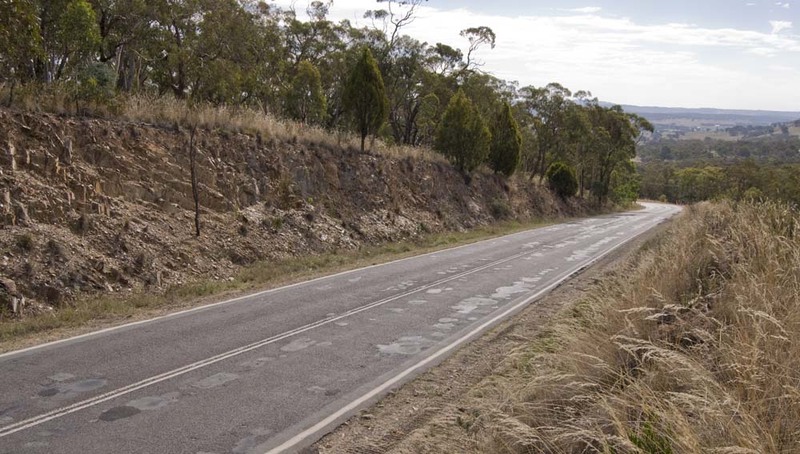 Federal Highway traffic should detour via Bungendore Road. Sutton Road traffic should detour via [Denley Drive/Weeroona Drive/]Norton Road. 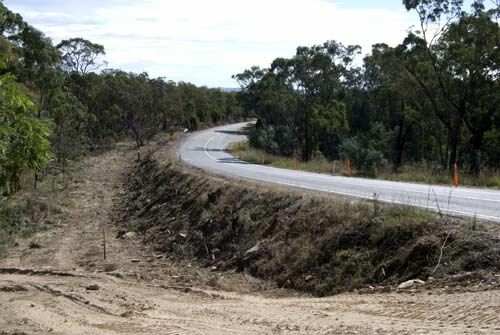 When the major earthworks are complete, Macs Reef Road will again be open to through traffic. Motorists are nonetheless advised that delays can be expected throughout and to use alternate routes for the duration of the roadworks. There's a great deal of anxiety circulating unnecessarily in parts of the community at the moment over land use zoning in the draft PLEP. Be assured that WCA representatives were present at every council meeting that dealt with the development of the new PLEP, to represent the interests of our local community. In particular, Council took advice from the WCA when identifying the zoning for the area and the land uses that would be permitted with or without consent. 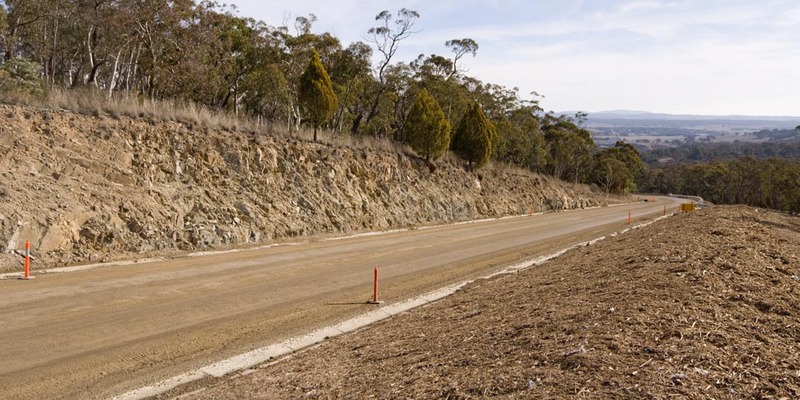 The use of new zones and land use definitions has been mandated by the NSW government—it's not something that Palerang Council has done off its own bat. Any apparent anomalies are likely just oversights that will be corrected as soon as they are brought to council's attention. If there are any omissions or oversights in the way the old zoning and land use have been translated onto the terms of the new LEP, it's most likely that they are just that—simply errors. One of the primary functions of the current public exhibition phase of the PLEP development process is to identify these errors. The intent was always to do a simple one-to-one map, to effectively allow everything that was currently allowed. Given, however, that council is required to use a different basic document template and a different land use 'dictionary', the mapping process was never going to be easy. In particular and contrary to rumours that are circulating, general agricultural activities such as grazing are considered to be ancillary activities in a rural residential area (no matter what the zoning E4 or R5, or anything else for that matter) and do not require development consent. At this stage, there's no point losing sleep over anything. The most helpful thing residents can do is to write down their concerns and forward them to council (email to records@palerang.nsw.gov.au is fine, but you can use paper and an envelope too!). Most of the issues that have been raised to date are the result of misunderstandings, either of the structure of the document itself, of the meaning of the new terms, or of basic planning practices. Residents should understand that, as has always been the case when regulations change, existing use rights prevail—you can continue to do anything that is currently legally allowed, in perpetuity, and these rights remain with the land (i.e. they are not extinguished with a change of ownership). Chinese whispers are funny when they're part of a game, but quite unproductive when they deal with real world situations. If you hear something about the new regulations that sounds unbelievable, then it's probably the result of a misunderstanding. 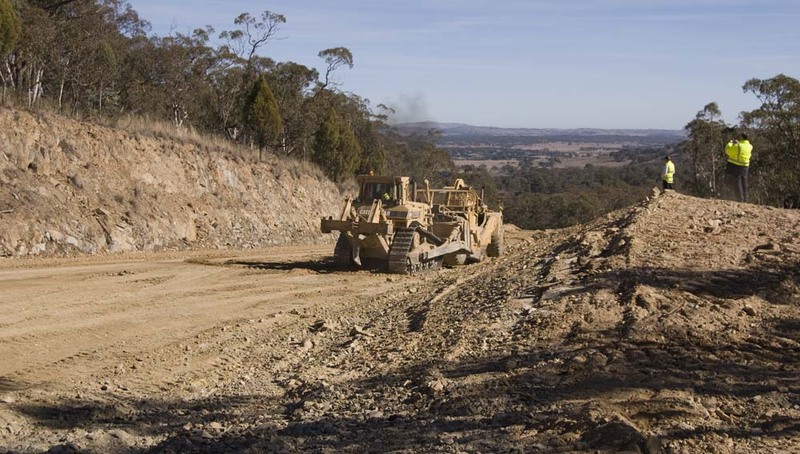 Before wasting any energy worrying about the consequences, contact either the Palerang Council planning department (see council's website for details), or email one of your local councillors to seek clarification. During the declared bushfire danger period (normally 1st October - 31st March) a Fire Permit is required for any fire in the open. For further advice and to seek a Fire Permit contact the local Fire Control Centre (Lake George Zone FCC in Queanbeyan) on (02) 6297 1840 during weekday business hours. the local Fire Control Centre (Lake George Zone FCC in Queanbeyan) on 6297 1840 during weekday business hours at least 24 hours before you light the fire. WCA President and returning councillor Pete Harrison was elected, unopposed, mayor of Palerang at the extraordinary meeting of Palerang Council on 20 September 2012. Returning councillor Paul Cockram was re-elected Deputy Mayor. 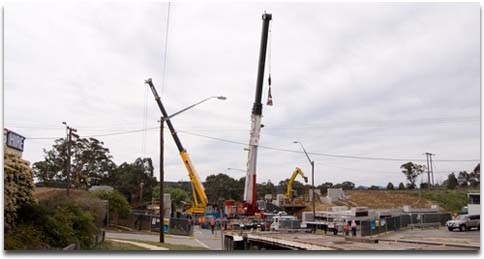 Following extensive community consultation, Telstra has finally gained approval to construct a new mobile phone tower to improve service in the Wamboin/Bywong area. After the brief Wamboin Community Association General Meeting on 20th September, a Telstra team led by Rob Cusack, Telstra Program Delivery, addressed those present. Rob took numerous questions and comments over at least an hour from the audience of 40+ residents of Wamboin and Bywong. He was assisted by Liz Easton of Aurecon (town planner), and two local Telstra Customer & Commercial Service representatives, Dawn Goodburn and Kelly Lolesio. The audience's questions covered a wide range of concerns, including the coverage to be expected, the levels of radiation to be expected, the community consultation opportunities, the reasons for not proceeding at the Poppet Road and Milpost Hill sites, the sorts of modelling that were carried out and the expected life of the proposed tower. 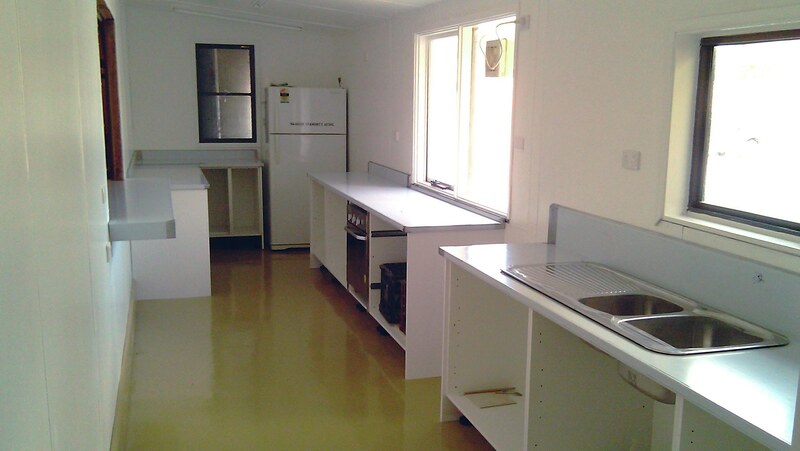 The site is on the property at 194 Denley Drive, Wamboin. Following the original effort to locate the tower on Millpost Hill, this site is now Telstra's preferred site because it best meets the variety of appropriate criteria, including coverage, a landholder willing to offer the site, environmental considerations and access for construction and maintenance. The tower receives and transmits wirelessly to residents' phones and other devices. It simultaneously communicates with the broader Telstra network, probably through microwave to the tower at Goorooyaroo, nearer to Sutton. 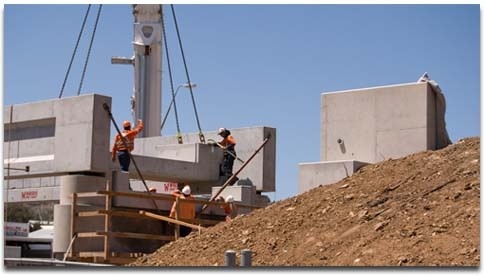 With the DA now approved, construction should be complete by mid 2012. 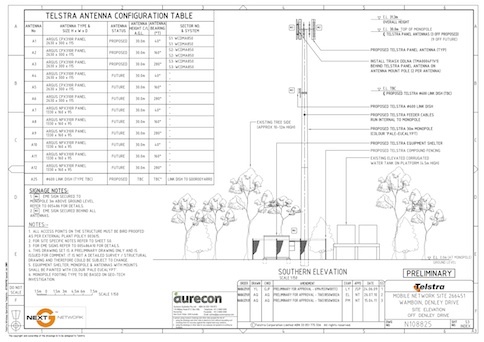 The photos, charts and maps relating to the tower, which appear below, were created and supplied by Telstra for the purpose of providing information to Bywong and Wamboin residents. The maximum level of radio signal (EME) emitted by the site will be a small fraction of the permissible levels. Predicted levels are 0.11% of the Australian Standard which is 909 times less than permissible levels. The following are actual "Before" (left) and projected "After" (right) photos of the proposed mobile phone tower, created and supplied by Telstra. Click on the individual images to enlarge them (the tower is the skinny stalk on the skyline). The map below illustrates the existing Telstra mobile phone towers (yellow 'pins') that already service areas in and around Wamboin and Bywong, and the proposed new site on Denley Drive (red pin). 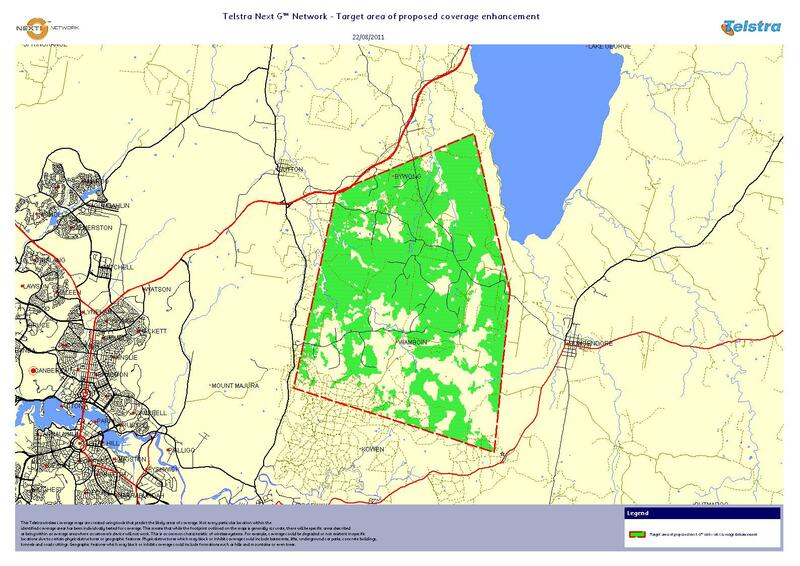 The polygon represents the general area where existing coverage would be improved by the proposed new tower. 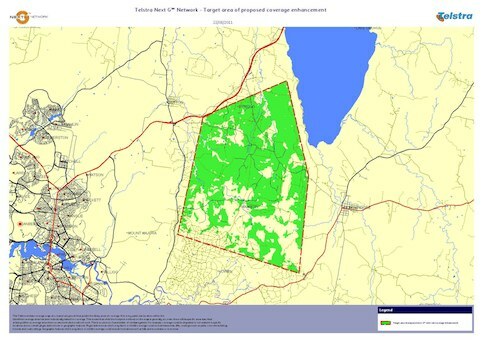 The green areas indicate where it is predicted that the new tower will provide high quality, in building, broadband coverage. There may be coverage improvements of a lesser degree to areas that are not shaded but it is not possible to further qualify these improvements in this format. 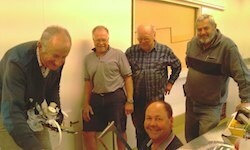 The Community Hall has been a veritable hive of activity of late, as Lofty and his band of merry men (and Joan) tackle the task of renovating the kitchen. 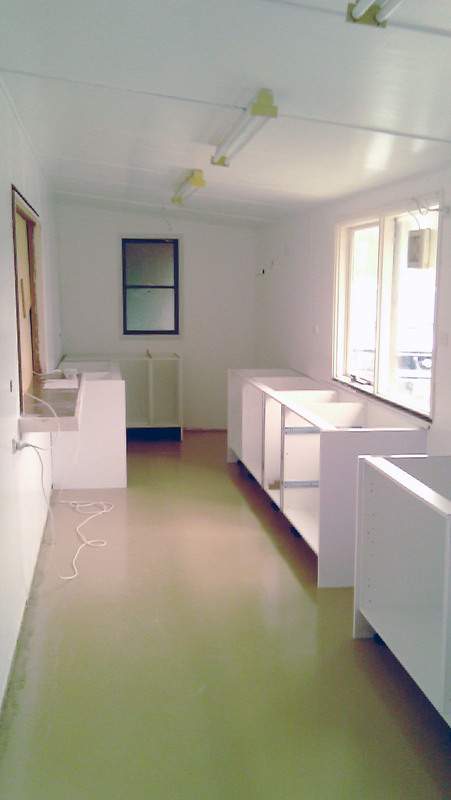 Our first step was to purchase and assemble the kitchen cupboards. In the same fell swoop we bought a new sink and under bench oven. 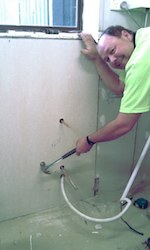 Then the wrecking and repairing began. My wife says ‘that a mess means progress’ but this was ridiculous. Out came the old collection of cupboards. 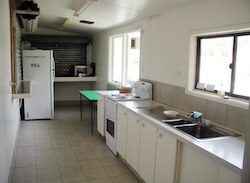 The outside servery and east wall was dismantled. Ceiling lights and panels removed. The stove was disconnected and everything that was moveable was stripped out. After repairing the east wall and with a new servery window in place, the floor tiles were removed. Meanwhile on the roof Don removed the old ventilator (which was jammed with an underarm spray can) and repaired the leaks. 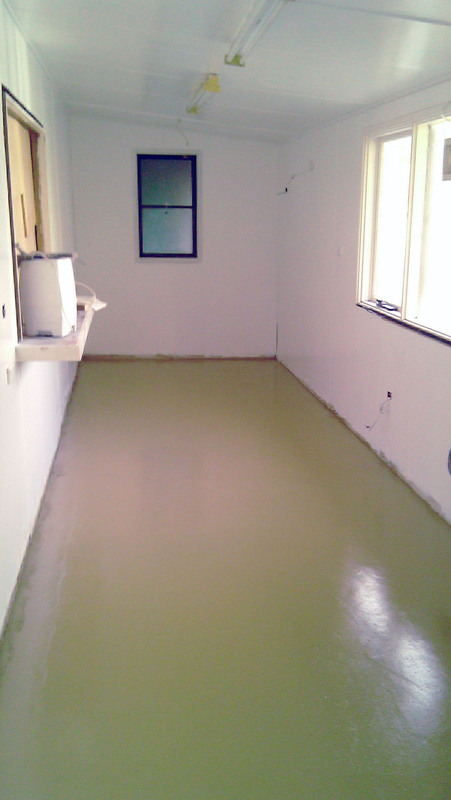 Using a hired concrete grinder on the kitchen floor a slurry pond was created which finally cleared to reveal cleaned concrete. We had the mess so how about some progress? 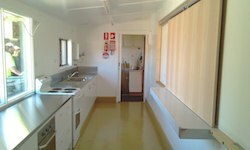 At this time we still have panels to repair and painting to do before the cupboard shells are installed and dressed. 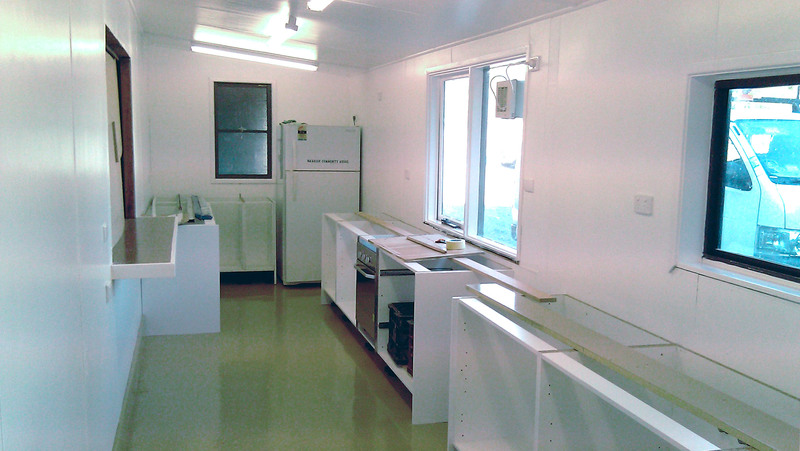 We will then have the stainless steel bench-top installed. The list of workers to date include: Peter Greenwood, Charlie Montesin, Ron Shepherd, Don Evans, Trent Abell, Tim Barter, Keith France and Ian Coillet. Joan has done a great job feeding and fuelling the workers. I also appear on the list as my position as ‘project officer’ ensures I can be blamed for any mistakes. I include a special thanks to Steve Hughes of ‘The Feed Shed’ in Bungendore who has made an unsolicited gift of $200 to our project. 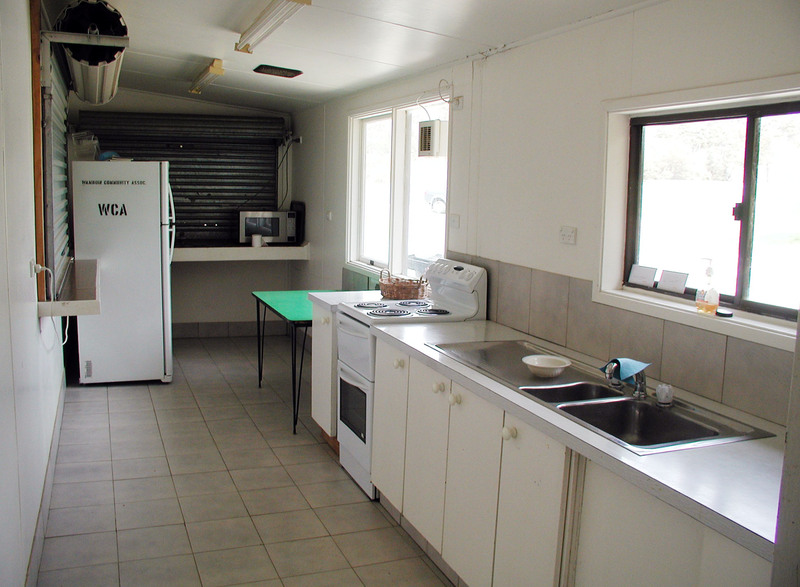 We plan to purchase a ‘Feed Shed’ microwave oven. 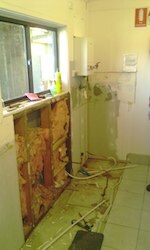 The attached photos show that considerable progress has been made. The only extra wrecking as listed last Whisper was the removal of the servery roller shutter and surrounding trim. 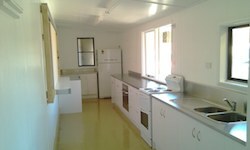 We have now replaced and painted all wall and ceiling panels, painted the floor and installed the cupboard shells. The ceiling lights have been replaced and new power points fitted. These power points include one in Hall for the heater and one on the entry veranda. The stainless steel bench-tops and servery shelf were delivered last Monday, with the final installation of stainless steel fittings, and the doors and draws fitted to the cupboards today. 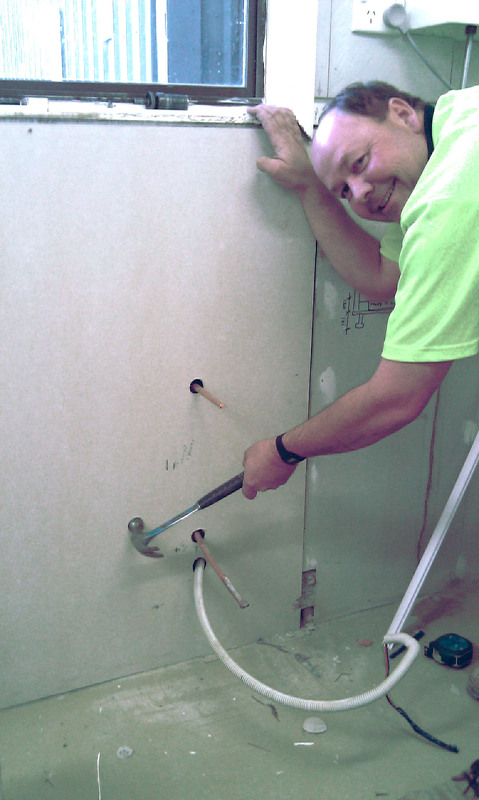 Hank Berlee has joined the list of workers since he returned from Queensland and Councillor Pete Harrison has taken on the repair of plaster and the painting of doors and architraves. 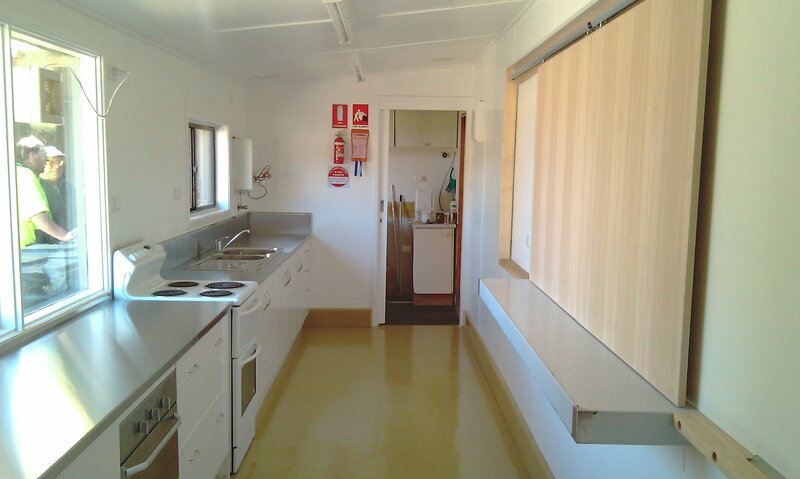 Future work includes the fitting of sliding doors in the servery window, the manufacture and fitting of cupboards in the entry plus a mop drying rack outside. 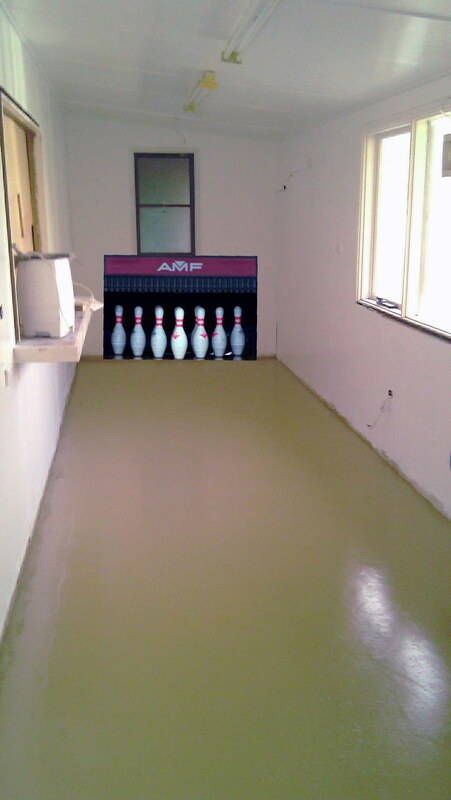 Finally we also plan to renew the leaking gutter along the south side of the Hall. And that I hope will be the finish of this project. Check for the final chapter in the coming weeks! The proposed site is on the property at 194 Denley Drive, Wamboin. This site is now Telstra's preferred site because it best meets the variety of appropriate criteria, including coverage, a landholder willing to offer the site, environmental considerations and access for construction and maintenance. 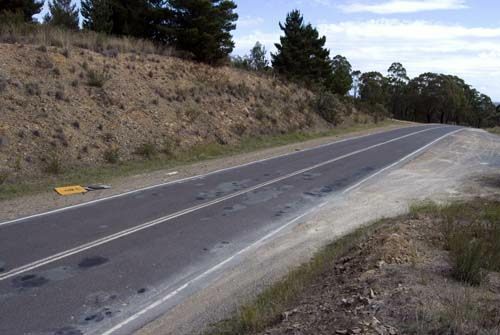 The relevant Development Application has now been submitted to Palerang Council. The DA process usually takes at least three months. Community reaction to the DA is invited. After this process, if and when the possibly revised DA is approved by Council, construction usually takes about six weeks. 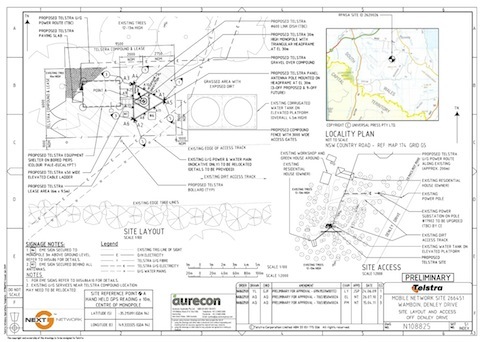 The photos, charts and maps relating to the proposed tower, which appear below, were created and supplied by Telstra for the purpose of providing information to Bywong and Wamboin residents. 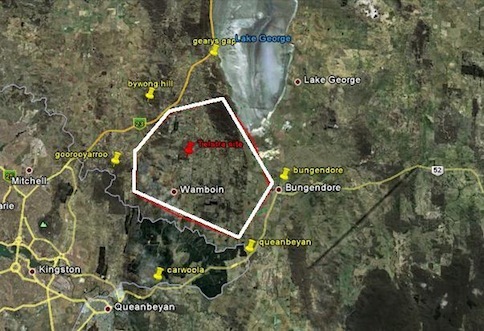 The Wamboin Volunteer Rural Fire Brigade wish to advise local residents that the 2011 / 2012 fire season for the Lake George Zone (LGZ) has been brought forward - to begin on the 1st of September 2011. The LGZ includes all localities in the brigade's area i.e. 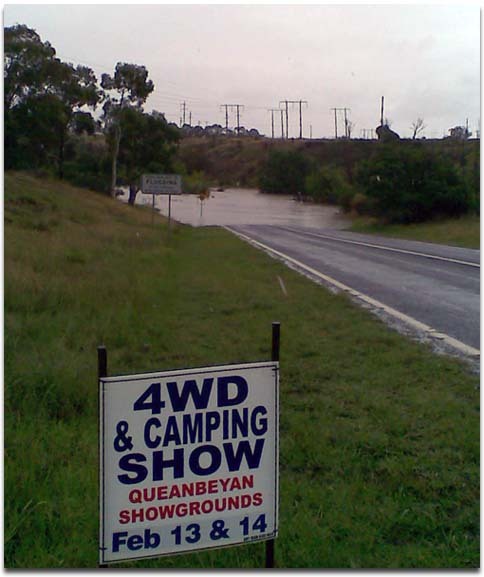 Bywong, Sutton (south of the Federal Highway) and Wamboin. Unusually high fuel loads in the region and the expected dry conditions over the coming months are the main factors for the decision to bring the start of the fire season forward 1 month. Residents should be aware of the inherent risk this coming fire season poses, and remind all to follow fire safe practices when working with equipment and machinery outside in the region. The Wamboin Brigade holds regular attendance on Wamboin market days for anyone wishing to enquire about fire safety. A number of specialised and focussed information sessions are expected to be held at various times during the fire season to keep local residents informed. The first of these sessions is a community-wide bush and grass fire awareness/preparation information session on 17th September (read more). For more information please contact the Captain or Secretary of the Wamboin Brigade. In the August Whisper I wrote asking for expressions of interest for people to come along to the Wamboin Community Hall on Saturday 30 October 2010 to hear John Asquith (CEO of the NSW scheme) speak about the Land for Wildlife scheme. Unfortunately few people have shown an interest so far. 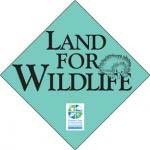 You can find out more about the Land for Wildlife program at www.cen.org.au/landforwildlife or give me a call. As mentioned last month, the Land for Wildlife scheme encourages property owners to commit to managing all or part of their land in an environmentally friendly way. The program is free to join and is not legally binding. 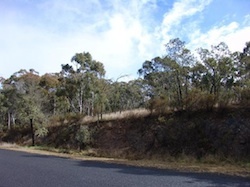 The minimum size of land to register is half a hectare of native bush land. Over time the scheme not only provides refuges for wildlife, but allows wildlife corridors to be created where Land for Wildlife areas match up. It also gives us encouragement to look after our wildlife and enjoy having it around. If you are interested in meeting John Asquith on 31 October could you get in touch with me by 22 September 2010 please? I can then decide whether to go ahead with the meeting. If there are only a few people, then we may not need the hall as a meeting place. 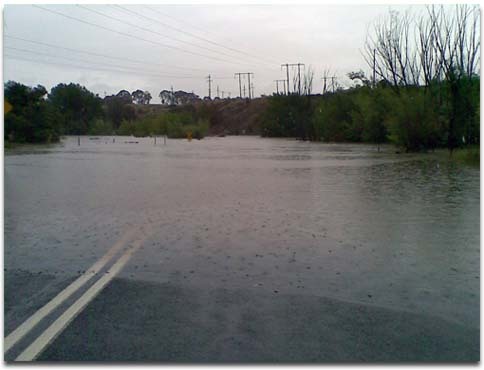 Wamboin received around 100 millimeters of rain on Valentine's Day weekend. These photos show some of the area's waterways between 2:00 pm and 3:30 pm Sunday, Valentine's Day. 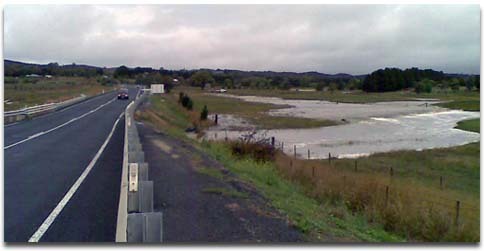 The major culverts on Sutton Road about halfway between Pialligo Avenue and Norton Road. These culverts are designed to withstand a 100 year flood. The Oaks Estate crossing, approached from the north. The creek that Jo Walker sometimes mentions in her Whisper articles. 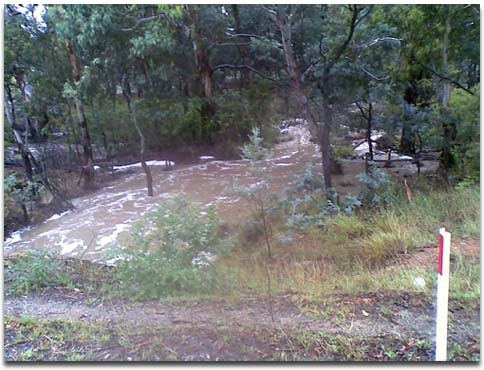 It crosses under Norton Road about 100 metres east of Fernloff Road. 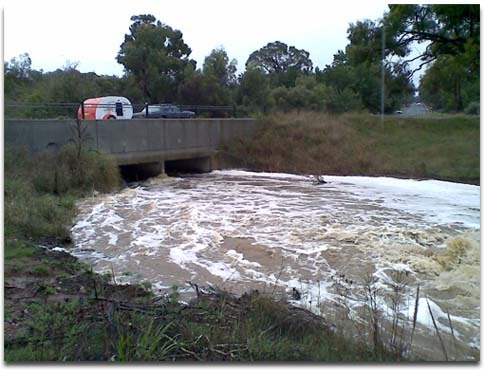 The Yass River from its crossing under Norton Road a few hundred meters west of Weeroona Drive. 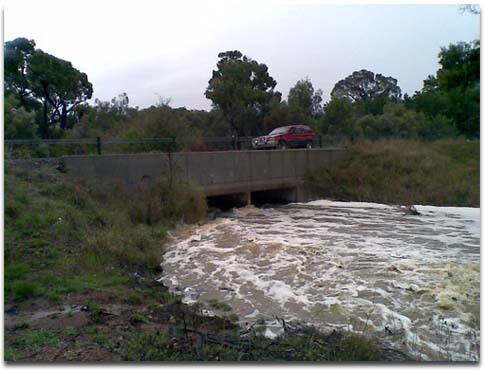 Reedy Creek crossing under Bungendore Road between Macs Reef Road and Norton Road. 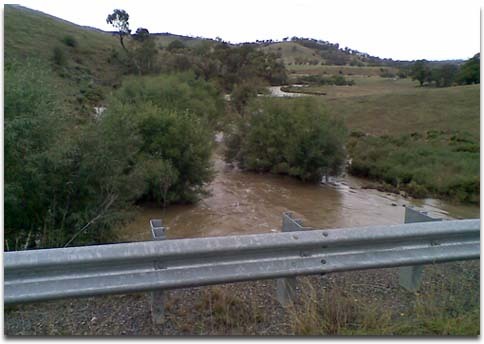 The Yass River from the bridge just south of the Federal Highway. The essential bridge work is now complete, although the tamping machine is still working on the track. 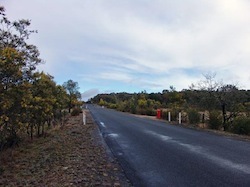 While Yass Road is again open to traffic, there will be ongoing roadworks in the area for several days while landscaping work is completed. 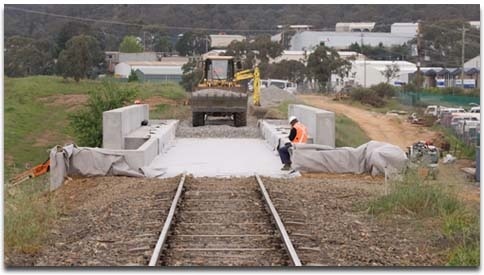 The track has been laid and is currently being leveled with the aid of specialist railway machinery. The larger piece of equipment in the photos is a tamping machine. 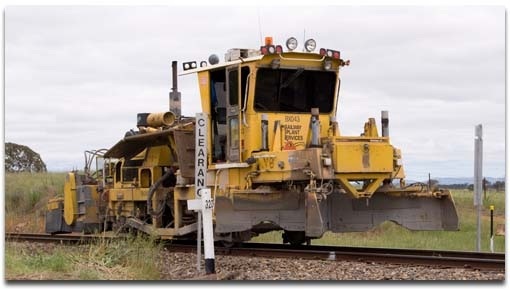 Once the track has been laid down, this machine measures the level of the track at each sleeper. 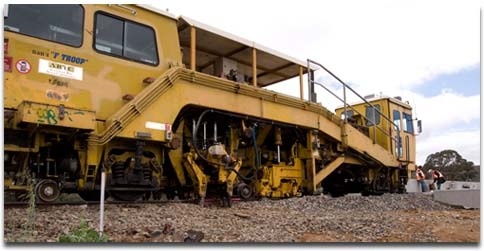 Using hydraulic rams and tamping bars, it moves the track up or down, as required, tamping the track ballast (rock foundation material) to the required level. The smaller machine is its constant companion, a track sweeper, that follows behind clearing the excess material away from the track. 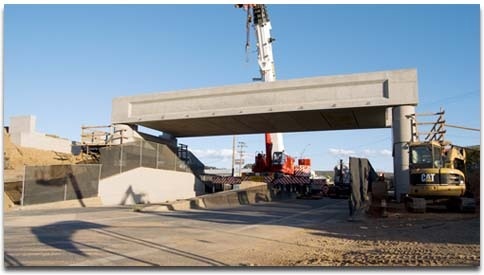 Everything is on track for the bridgework to be completed and for Yass Road to be reopen this evening. 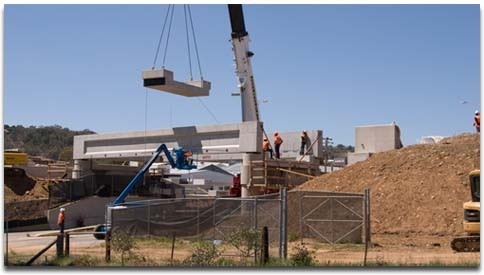 The new Yass Road railway bridge is taking shape, as works continue apace. It's just like Meccano! 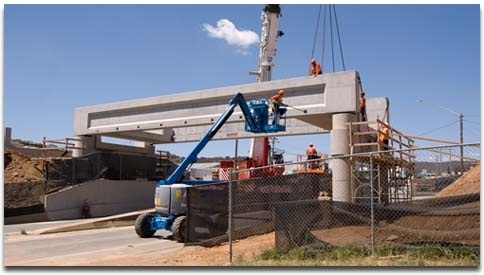 The main spanning beams are set, and the cross-members are being moved into place. 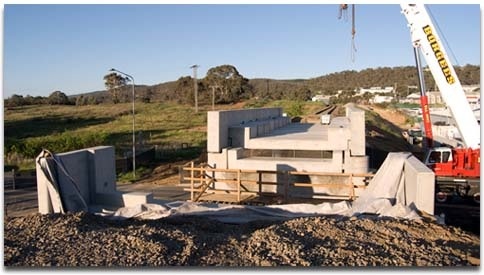 Works on the Yass Road railway bridge upgrade began at 6.00 am this morning (Friday). 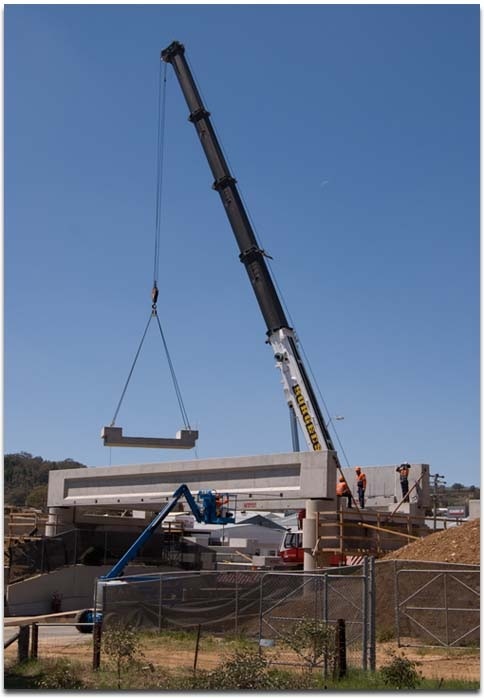 By early afternoon, the old bridge had been fully dismantled and cranes were positioned to begin moving the new, precast concrete beams into place. Check back over the weekend for more photos of the construction process. 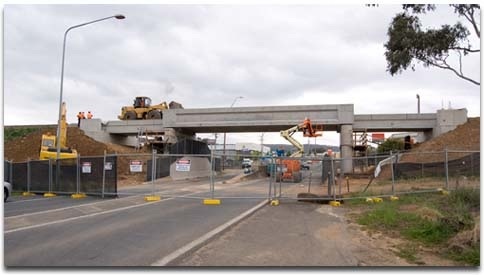 To allow for the demolition of the existing bridge and the construction of a new bridge, the section of Yass Road between Sutton Road and the entrance to the Airport International Motel will be closed to all traffic. The closure will be in place from 6.00 am on Friday 23rd October 2009 until 6.00 pm on Monday 26th October 2009. There will be advanced warning signs placed at numerous locations to advise the public of this event and the detours available. 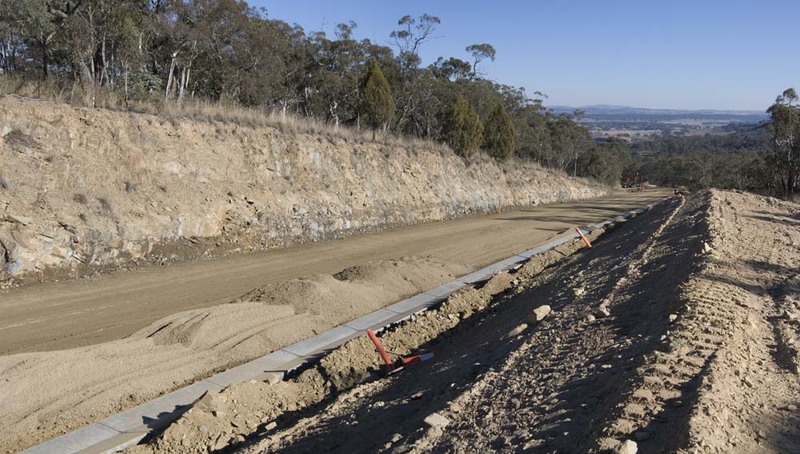 Pialligo Ave traffic to Queanbeyan & Kings Highway will be detoured via Oaks Estate Rd, Railway St to Uriarra Rd. 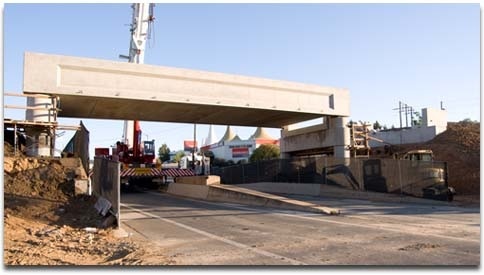 Canberra Ave traffic to Sutton Rd will be detoured via Norse Rd, Railway St and Oaks Estate Rd. Lanyon Dr traffic will be detoured via Canberra Ave, Kendall Ave North, Uriarra Rd, Railway St & Oaks Estate Rd. Following an application made last year, Palerang Council has received a Library Development Grant of $11,874, to be used to augment library holdings of titles relating to "Non-Fiction Reading for Men and Boys". As the grant application was formally supported by the WCA, Council is seeking our input in selecting titles to add to the Bungendore and Braidwood libraries. If you have any suggestions for subject areas or topics that you would like to see, or that you think would be of value in the present context, please pass them on to John van der Straaten or Pete Harrison (see Contact Us), or email them to the WCA secretary at secretary@wamboincommunity.asn.au by December 13, 2009.